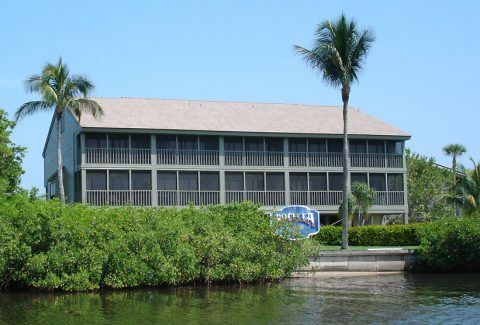 Enjoy a tropical island resort nestled on the gulf coast of Southwest Florida! Slip away into a tropical paradise as wild and natural as Florida has to offer. Bocilla Island Club is the gateway to a part of Florida that few people can even imagine. Watch dolphin play in the bay as you listen to osprey from one of your screened lanis. Surrounded by a lush abundance of flowers, palms and mangroves, you can relax by one of the swimming pools, play tennis or hang out in the gazebo. But like many visitors, you may find yourself casting off the 400 foot private pier to have your luck at fishing for tarpon, snook, red fish, shark, sea trout and much more in the Gulf waters of Charlotte Harbor. The sunsets are breathtaking from the pier and on most evenings you can see manatee swimming nearby. Bocilla Island Club is the ideal place to canoe, kayak, fish, and motorboat. The club even has it’s own marina and boat ramp. The unit also comes with it's own private 23 foot boat slip. G35 is an end unit townhouse and sits on the water, with beautiful views of Jug Creek and is only a short boat ride from the famous Boca Grande Pass and the pristine beaches of Cayo Costa.